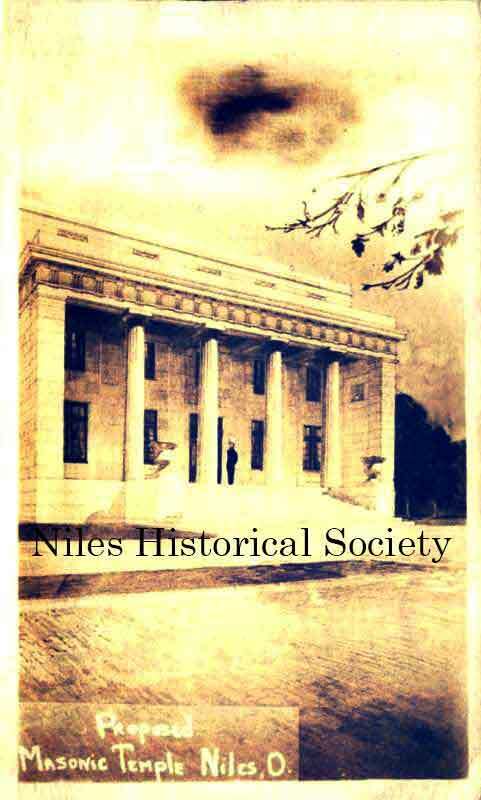 The proposed Masonic Temple that was to be built in Niles. 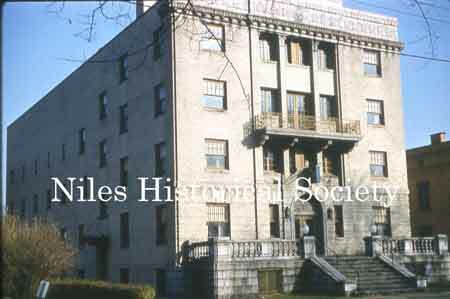 The Masonic Temple was constructed in 1922. 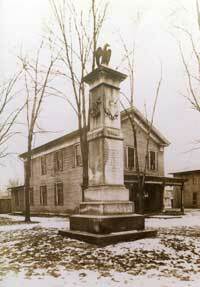 On June 24, 1867, sixteen Masons read a dispensation empowering them to organize Mahoning Lodge. On Oct. 28, 1867, Mahoning Lodge No. 394 was constituted and consecrated. The first lodge room was in the H.H. Mason Building, on the corner of Main and State Streets, later in the Benedict Block on Main Street, the Wagstaff Block on Main Street and the Reeves-Leitch Block on East State before moving into the present Temple on July 30, 1922. On January 24, 1906 , thirty five people met at the Mahoning Lodge #394 Free and Accepted Masons to take action in the matter of organizing a Chapter of the Order of Eastern Star. A petition asking for a dispensation to institute a Chapter was sent to Grand Patron, J. M. Longnecker, signed by the thirty five people present. This petition being granted on January 29, 1906, the group met again on February 12, 1906 at which time the name of Ida McKinley was chosen because the meeting hall was located where William McKinley’s birthplace had stood and the dispensation was granted on his birthday. President McKinley died on September 14, 1901 and Mrs. McKinley passed away in 1907. There is no record of her having belonged to Eastern Star. The Masonic Temple as it appeared in the 1930s. On February 16, 1906 Ida McKinley Chapter #229 was instituted by Morning Light Chapter #80 of Warren. Margaretta Thomas Chingan was a charter member and she served as Worthy Matron in 1910 and in 1911. It was interesting to note that $6.oo was paid for the special street car which brought the Warren Chapter to Niles for the occasion. At the first inspection held on October 5, 1906 a supper was served at $.35 a plate. Electricity was installed in the meeting hall in May 1909. 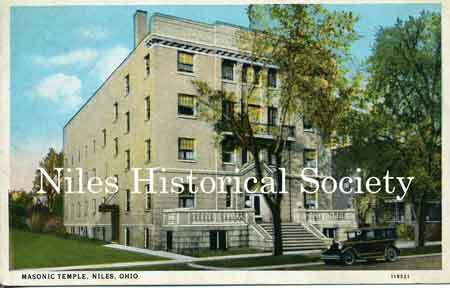 On March 11, 1922 Ida McKinley Chapter instituted Sunrise Chapter #458 in Girard. Mable McCaughtry was Worthy Matron and her Chapter dress is now in the collection of items at the Ward Thomas Museum. Ida McKinley Chapter met at the Mahoning Lodge until July 20, 1923 when members met in the new Masonic Temple located at 22 West Church Street. Many years of preparation made this building possible, due to a special building fund. Eastern Star furnished the kitchen, ladies parlor, and dressing room and helped to pay for the furniture in the Lodge Room. The Masonic Temple as it appeared in the 1960s. 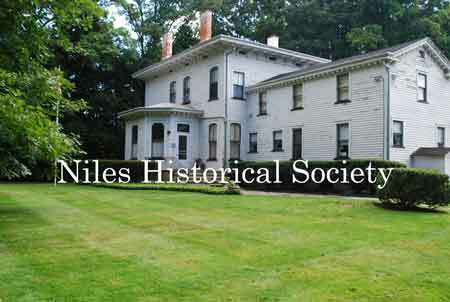 The Chapter served its first Mahoning Valley McKinley Club Banquet in 1947. This was a huge undertaking because there are no kitchen facilities at the McKinley Memorial Auditorium where the annual dinner was held. The food was prepared in the Temple kitchen and transported to the Memorial by truck where servers managed to get hot meals to the many dignitaries and guests to enjoy. This tradition continued until the members were no longer able to undertake this task. Local caterers serve the banquet now. 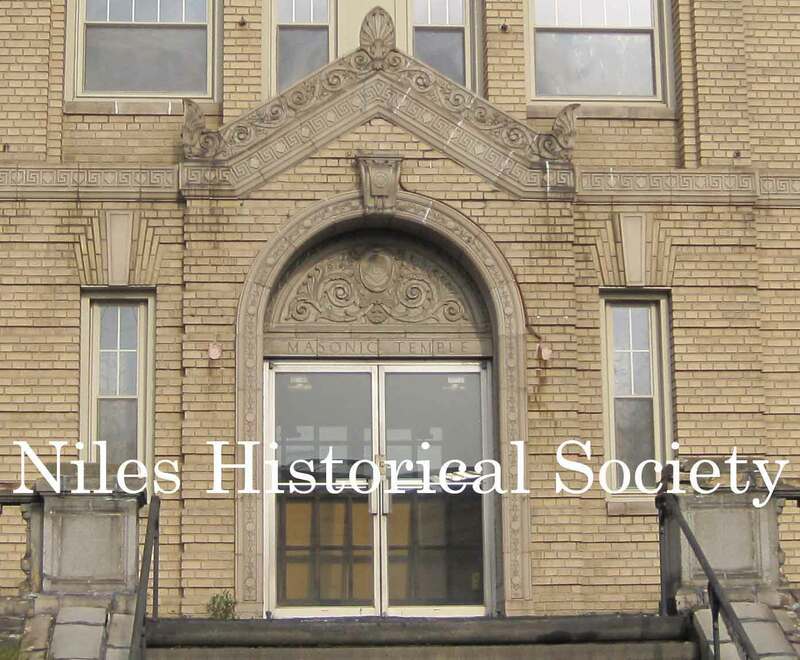 Profits from serving the McKinley Banquet helped to finance installation of the elevator in 1947, chairs for the dining room in 1965 and tables in 1967. 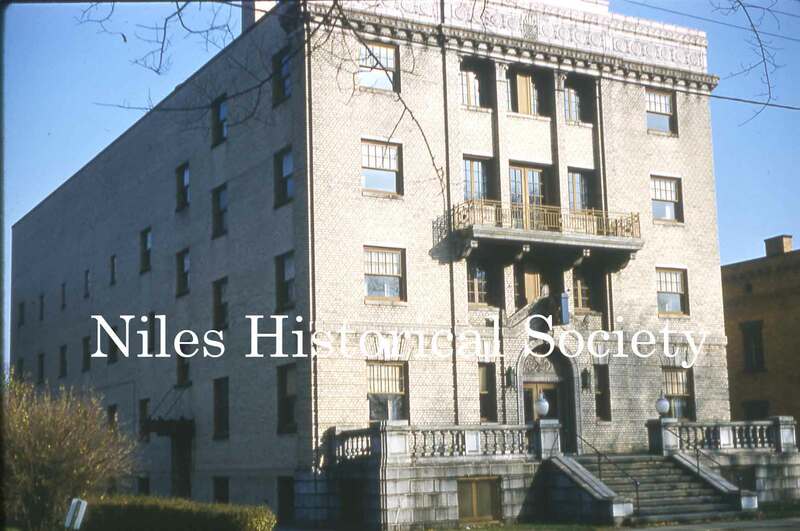 The Chapter gave $100.00 to the building fund of the McKinley Memorial, dedicated October 5, 1917 and has given to the Red Cross and various Community Funds over the years. The 100th Birthday celebration was held on February 17, 2006 with a dinner served before the stated meeting. After the closing of the Chapter, the officers presented the beautiful Floral Degree which was brought from Michigan to Niles by Clara Lowendorf, who served as Worthy Matron in 1914 and 1915. Birthday cake was then enjoyed in Fellowship Hall. 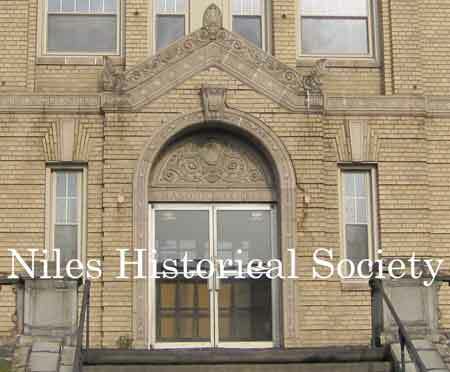 The front entrance to the Masonic Temple. Due to declining membership and inability to elect line officers, members voted on December 15, 2006 to merge with Opal Chapter #181 in Cortland. 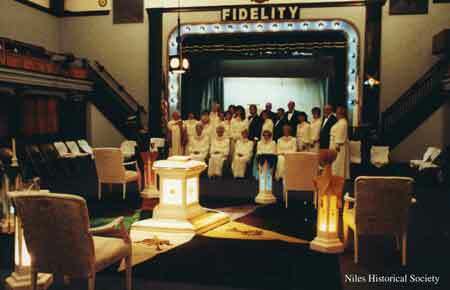 The final meeting of Ida McKinley Chapter was held at the Temple in Niles on March 16, 2007. Opal Chapter welcomed Ida McKinley Chapter at a special merger ceremony held at the Cortland Masonic Lodge on March 27, 2007. The ceremony of the Eastern Star. To give credit where credit is due, I have summarized Chapter history, compiled by Pauline Crofford, Worthy Matron 1935 and Helen Crofford, Worthy Matron 1968 and 1974. I added the final chapter. 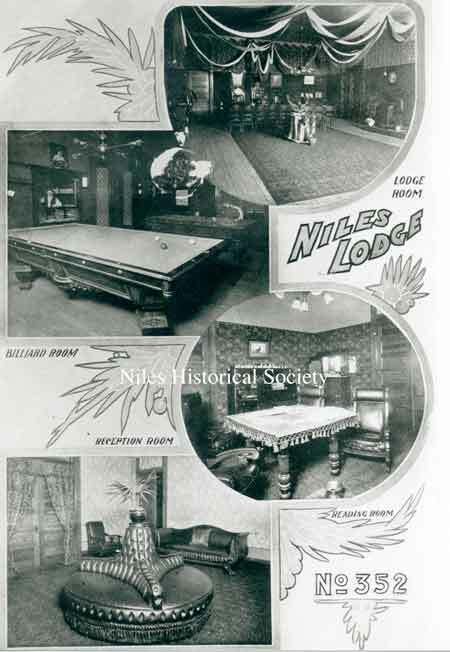 A montage of interior rooms in the Niles Masonic temple used by the Masons, Eastern Star, York & Scottish Rite Masons and home of Mahoning Lodge No. 352.